Perhaps we have a deep and legitimate need to know in our entire being what the day is like, to see it and feel it, to know how the sky is grey, paler in the south, with patches of blue in the southwest, with snow on the ground, the thermometer at 18, and a cold wind making your ears ache. I have a real need to know these things because I am myself part of the weather and part of the climate and part of the place, and a day in which I have not shared truly in all this is no day at all. Thomas Merton, 1915-1968, was a trappist monk and a prolific writer. His artistic legacy — comprising poetry, personal journals, collections of letters, and numerous writings on peace, justice, and ecumenical issues — is housed at the Thomas Merton Center at Bellamine University. Among Merton's more than 70 books are The Seven Storey Mountain, No Man Is an Island, New Seeds of Contemplation, and Zen and the Birds of Appetite. This has been a week of "finds". Here are six that I'm pleased to share with you today. ✸ German wood carver Veit Stoss is the subject of a Jonathan Jones post on the meaning of craft as exemplified in "hyponotising accomplishment, in wood". ✸ Renwick Gallery curator Nicholas Bell is interviewed here about glass artist Karen LaMonte whose stunning "Reclining Dress Impression with Drapery" has been acquired by the Renwick, part of the Smithsonian American Art Museum. (Lucky are those of us living in the Washington, D.C., area.) The acquisition is part of an extraordinary glass dress series that took LaMonte approximately 10 years to complete. LaMonte is presenting an illustrated lecture at SAAM on February 26. ✸ A Maya Stein poem on a blog I follow sent me to her Website. Stein seems to have her hand a little bit in lots. Her poetry, which she shares in weekly bytes she calls "10-line Tuesdays", is worth more than a casual read. ✸ Jay Adler's blog, itself an often fascinating place to land, sent me to BloodLotus, an online literary journal that publishes poetry, fiction, and "anything in between" (ponder that!). The cover of Issue 14, "Georgia's mask" by Megan Pinch, was hook enough for me to dive in. ✸ All the Words is a place where "words roam around and make a lot of noise" until their owner "lets them out to play". Take a look at the poems here. You might find more than a few you'd like to invite onto a keepsake page. ✸ Cathleen Falsani, formerly religion writer for the Chicago Sun-Times, is an author of several books, including The Dude Abides: The Gospel According to the Coen Brothers. She blogs at "The Dude Abides". Her Website, GodGrrl, tracking the adventures of Cathleen Falsani, is here. 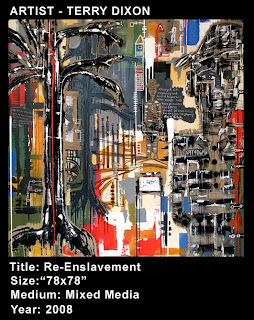 The work of artists Terry Dixon and Robert Morris make up "Re-Enslavement Revisited", a mixed-media exhibit inspired by Douglas Blackmon's Pulitzer Prize-winning book Slavery by Another Name: The Re-Enslavement of Black Americans from the Civil War to World War II (Anchor Reprint, Paper, 2009). Part of the D.C. Public Library's celebration of Black History Month, the show opens February 1, at Martin Luther King Jr. Memorial Library (901 G St., N.W., Washington, D.C. 20001; 202-727-1213), and runs through the end of the month. The opening reception on February 1 is scheduled at 6:00 p.m.; the artists will be available to discuss their work. Integral to the exhibition are video interviews with Blackmon that describe how government and judicial systems worked in tandem with industrial corporations to achieve re-enslavement. Related activities during the exhibit include a slide show and talk with the artists, at 5:30 p.m. on February 23, and a talk and book sale-and-signing by Blackmon at 6:00 p.m. on the same evening. Born in Washington, D.C., Terry Dixon lives and works in the greater Chicago area. Art comes to him naturally; his mother is an artist and his father was an advertising director. Dixon received his B.F.A. from the Atlanta College of Art and his M.F.A. from The School of the Art Institute of Chicago. He describes his art as interdisciplinary, an integrated mix of abstracted painting, photography, computer art, video, and electronic music. His painting style, he says on his Website, is "sometimes aggressive and sporadic and then slows down to a smooth sense of control." Even line and brushstroke, he adds, is "a free flowing idea" deeply rooted in sight and sound, especially jazz, and influenced by African art and culture, as well as political and social issues. Featured in the May 2, 2005, American and European editions of BusinessWeek magazine's homage to "Photography's Golden Age", Dixon was cited as one of the next up-and-coming artists to consider collecting. He was singled out for his techniques of combining photography with abstract painting. Exhibition work by Georgia artist Robert Morris includes "Long March", Baylane", and "Middle Passage". The latter mixes acrylic on gesso board with news articles from the era announcing the arrival of slave ships sailing into the Savannah harbor. Unfortunately, Morris does not have a Website; however, images of both "Baylane" and "Middle Passage" can be viewed here by scrolling to the bottom of the page. This is superb work that addresses a deeply unsettling period in America's history. A multi-part PBS series based on Blackmon's book is being developed by National Productions and is slated to broadcast in 2011. You have just tonight and tomorrow to catch the last two performances of Incorruptible! by the Spot-LYTE Company (Lorton Youth Theatre Ensemble), the resident theatre company at the Workhouse Arts Center, Lorton, Virginia. A comedy set in the Dark Ages in France, Incorruptible! tells the dark tale of French monks struggling to save their monastery from economic ruin and themselves from an onslaught of lies, thievery, and mistaken identities. Show time is 8:00 p.m. Ticket information is here. Three exhibits continue at the McLean Project for the Arts, McLean, Virginia: New Synergy: Sculpture by Nicole Fall, Terry Schupbach-Gordon: Artist Books, Prints and Drawings from Catbird (on the Yadkin Press), and New Works by Gretchen Schermerhorn. All three shows run through March 6. Additional information is here. Transhuman Conditions opens tonight at Arlington Arts Center; the reception is 6:00 p.m. - 9:00 p.m. The exhibit, which runs until April 3, features the work of 10 artists (from Maryland, Virginia, New York, Texas, Canada, and the United Kingdom) who have been asked to think about the future of the human body. The catalogue for the show includes essays by Joel Garreau, senior writer for The Washington Post and author of Radical Evolution, and curator Jeffry Cudlin. February at The Phillips Collection is for lovers of Georgia O'Keeffe. In addition to the exhibition of more than 100 of O'Keeffe's works, three related programs with curators are scheduled. On February 3, 5:30 p.m., Emily Fisher Landau, director of the Georgia O'Keeffe Museum joins museum curator Barbara Buhler Lynes and Elizabeth Hutton Turner, University of Virginia professor and vice provost for the arts, for a behind-the-scenes look at how the exhibition was created. On February 11, at 6:30 p.m., Turner returns for a discussion about O'Keeffe's approach to abstraction as a method. Then on February 18, at 6:30 p.m., Ruth Fine, curator of special projects in modern art, National Gallery of Art, discusses O'Keeffe's early charcoal drawings, watercolors, and pastels. All three talks are free to members. The film I Remember Better When I Paint, recorded in part at The Phillips Collection, will be screened on February 13 at 2:00 p.m. Filmmaker Berna Huebner will lead a discussion of the documentary, which provides testimonials about the positive effects of at on the quality of life of Alzheimer's patients. Applications for the 2010 Bethesda Contemporary Art Awards competition are available now. Better known as the Trawick Prize, the annual juried competition offers $14,000 in awards, including $10,000 for first prize. Details are here. If you enjoy museums, be sure to take a look at MuseumStuff. Lists are organized by dozens of art, history, and science subjects. Design Sponge shows you how to make fabric-covered buttons to show your support for Haiti. The buttons carry the message, "Help Haiti". ✝ HaitiHouses ~ This is an art project for children who want to raise money for Haiti. The following poem consists entirely of tweets I contributed during the TweetSpeakPoetry.com poetry jam on Tuesday evening, January 19, on Twitter. Generally, the lines appear as I tweeted them; some words or phrases from some lines have been combined with others or pulled out to form their own lines, and punctuation and capitalization have been added throughout. To see how all 21 contributors' tweets, including my own, were combined by our word-knitter Glynn Young into a poem called "Adam and Eve by the Narrow Lake", go here. Another series of three, also edited by Glynn, is here. The final piece from the evening, Poems in Conversation", is here. bent an ear to hear the music. did turn the landscape red. once more did greet him. Adam realized his great mistake. forming black as her feeling. Eve hath no need to be poetic. Let's free-associate for a minute. When you see, hear, or read that word, what comes to mind? Artist? Musician? Screenwriter? Creative? Self-discovery? Be honest. Not one of those words comes to mind, does it? What about this word: Possibilities? I imagine you still are shaking your head no. You. . . and you. . . and you, too. For most of us, associating any of those words with homelessness just doesn't happen. Some months ago, I wrote an essay about the award-winning film Humble Beauty, a documentary that opens our eyes to the beauty that is created by people experiencing homelessness. Today, I want to open your eyes again, this time to what can be accomplished when people believe in possibilities. Don't move the way that fear wants you to. My friend Louise is the public relations director for Calgary Drop-In & Rehab Centre (DI) in Canada, the largest in the country, providing in 2008 more than 350,000 bed nights to more than 12,500 distinct individuals. Louise writes, often movingly, about her work at DI on her blog Recover Your Joy. When I want a lift, I make sure to read Louise's blog. It's full of words about possibilities and about the hope that stirs when possibilities are offered. A DI lifeline, Louise wrote last week about a partnership between DI and a local church, and offered a glimpse of what that collaboration is producing. I was so taken by what is being achieved that I told Louise I intended to share a bit about the project on my own blog. The partnership is called The Possibilities Project. The title alone gives you some insight into DI's approach to homelessness. That approach doesn't start and stop with a handout of a warm meal and a blanket; though it provides emergency shelter, DI isn't defined as a stopping place for the night. Nor it is just a place that makes sure that the people experiencing homelessness have clothing to replace what they arrived in, or receive job-skills or job-placement assistance so they can become wage-earners if they're lucky, or get substance abuse counseling to get off the bottle or the needle — all services we typically associate with organizations like DI, wherever they're located. Most organizations concerned with homelessness are not like DI, however. DI is not your typical shelter. DI understands that shelter is not the problem and housing is not the solution. As you learn if you stick around Louise long enough, DI is about helping people reclaim their identity by providing them a place where they find respect, compassion, understanding, and resources. Resources like The Possibilities Project. In describing the project, Louise writes, "The intention was to create an opportunity and a space where individuals experiencing homelessness could explore their creativity [through the visual arts] and deepen their connection to themselves and the human condition we all share. There was no expected outcome, no destination, no measurement of success determined by how many brushstrokes were cast or notes sung." Imagine! Outcomes for the person controlling the purse aren't established. Achievement of goals to justify money spent isn't measured. There is no expectation that concrete process and procedures will be put in place as the project expands. There is no red tape! The wonder of it is this: The project is working for the clients who themselves had not equated the word "possibilities" with their lives. The Possibilities Project is providing a place and a time where DI clients are experiencing joy, excitement, serenity, and a sense of well-being. The only expectation, Louise says, is that the project will "continue to nurture the spirit of creativity at the heart of each participant" as each "self-directs the unfolding of possibility" in his or her life. As I said, DI is not a typical shelter. Some three-and-a-half years after its launch, The Possibilities Project encompasses not only painting and other visual arts, its basis, but also poetry, writing, drama, singing and other forms of music-making, and performance. Most recently, for example, the project made possible the participation of a DI client in a form of participatory theatre facilitated by David Diamond, director of Vancouver's Headlines Theatre. (Louise describes that activity, "Power Play: Homelessness", here.) Notably, DI clients have inspired Two Bit Oper-Eh?-Shun, an oratorio whose libretto was written by Onalea Gilbertson and whose music was composed by Marcel Bergmann. At different points in the production, DI's Drop-In Centre Singers performed their own music and prose. Two Bit had its world premiere on January 16 of this year and was reviewed by the Calgary Herald. The video below is an overview of The Possibilities Project, and supported a talk Louise gave recently. In affirms the meaning of art in the lives of DI's clients, it shows that homelessness is a condition and that art is a way into finding a way out of that condition, to healing and becoming. As Louise says, in committing themselves to taking action through their creative expression, those participating in the project are creating "a different kind of place [for themselves], a place where art awakens each of us to possibility in a place where people matter." Image: "Mermaid's Song" by Seymour Bottex. Courtesy Vassar Haiti Project. My poem "mourning haiku" is my contribution to today's Blog Carnival, which takes as its prompt the word "peace". Sponsored by Peter Pollock of "Rediscovering the Church" and Bridget Chumbley of "One Word at a Time", the Blog Carnival accepts contributions throughout the day. For links to others' offerings, go here, where Bridget is keeping track. * This is a line from poet Mark Jarman's "As Close as Breathing" in To the Green Man. The lines "peace I leave with you", "do not be afraid", and "my peace I give you" are from John 14:27. I am sponsoring today a Challenge for Haiti that will benefit the Vassar Haiti Project. Please see my announcement here. I wrote about the VHP here. I show below the badge for another nonprofit doing marvelous work in Haiti: Paul Farmer's Partners in Health. The organization has been delivering health care to Haiti's poorest populations for more than two decades. Other relief aid organizations to consider are listed here. Composer Cynthia Kendall has created a beautiful and haunting piece, "Tears for Haiti", that is posted on her own Website and on the VHP Website. The video, containing images of Haitian art provided by the Vassar Haiti Project, may be downloaded when a donation is made via Kendall's site. The Vassar Haiti Project is holding a sale of 200 Haitian paintings, silk scarves, jewelry, iron sculpture, and unique gifts at the Solomon Schechter School in Hartsdale, New York, on January 31, 9:00 a.m. - 6:00 p.m. Proceeds will benefit the VHP's earthquake emergency-relief fund for Port-au-Prince, home to many VHP-affiliated artists and the VHP's education initiatives. More information is available here. Bridget will be donating to WorldVision. Joyce will be donating to Vassar Haiti Project. Diane will be donating to Partners in Health. Heather will be donating to Week of Compassion. Kevin will be donating to Fellowship Agency for International Relief. Ginny will be donating to Samaritan's Purse International Relief. Joanne will be donating to Samaritan's Purse International Relief, too. JasonS will be donating to WorldVision. Tsholo will be donating to WorldVision. or slowly in a good direction? Swiss psychiatrist Bertrand Piccard went around Earth nonstop in a hot-air balloon. Now he wants to do the same thing in a solar-powered aircraft. He's been told this cannot be done. "Cannot" and "No": These words, quite simply, are a challenge that Piccard wholeheartedly accepts. Using his odyssey in a hot-air balloon as a metaphor for life, Piccard describes in this video how any of us might find motivation in the seemingly impossible, if only we get rid of unnecessary ballast. As you watch, imagine that unforeseen, even pioneering, direction in which you might fly with just a change or two in altitude. An article about Piccard's record-breaking balloon flight in Breitling Orbiter 3 is here. I participate with a wonderful group of people in the One Word at a Time Blog Carnival. Every two weeks those who take part in the Carnival blog in poetry or prose about a specific word. This Tuesday the word for the Carnival is "peace". I will be participating. I plan to do something a little out of the ordinary this time. In addition to posting my poem and linking my post to others' posts for the Carnival, I will be running a Challenge for Haiti. It will work like this: For every posted comment about my poem for the Blog Carnival, I will make a donation to the Vassar Haiti Project. (I wrote about the VHP on Friday; you may read that post here.) My donation goal is $100. That means I will donate $1.00 for every posted comment up to a maximum of 100 comments. 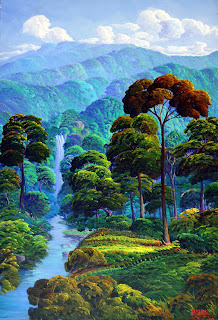 Image Above: "Mountains Beyond Mountains" by Haitian Adrien Seide. Courtesy of Vassar Haiti Project. I would be thrilled if others taking part in Tuesday's Carnival would consider adopting my idea. Let me know by 5:00 p.m. EST Monday (tomorrow) and I'll add your site link at the bottom of my post with the amount you'll be donating (or matching) and the relief aid organization to which you'll be donating. Any amount will help Haiti. Please join us Tuesday for the Blog Carnival and help meet the Challenge for Haiti. The Blog Carnival is on FaceBook. Links to posts for the Carnival appear either here or here on the Tuesday the Carnival takes place. I'll have a direct link from my post for January 26. Below is the badge for another excellent organization accepting donations for Haiti. PHP has more than two decades of experience delivering health care to the poorest areas of the island nation. Who we become depends on the choices we make. are made that shape our fate. what we decide to do determines what comes next. Jean Shinoda Bolen, M.D., is a psychiatrist, a Jungian analyst, and an internationally known author and speaker. Among her numerous books are Goddesses in Everywoman, Crones Don't Whine: Concentrated Wisdom for Juicy Women, and Giving Birth, Finding Meaning: Three Writers Explore Their Lives, Their Loves, Their Art (audiocassette). Read more about Bolen here. Nature has no meaning; its events are not signs. floats to the sea on jasmine. Say the word "Haiti" and many people think: vodou, political violence, desperate poverty. All three things are imprinted on the country but they by no means solely define it. Haiti also is where you find a storehouse of art: paintings as beautiful as the landscapes they reimagine, sculpture, vodou flag art (used to call upon spirits to ask for help), papier mache carnival masks from Jacmel (on Haiti's southern coast), steel drum and metal art, batik, and various forms of "street art". Since acquiring my first piece of Haitian art several decades ago — a one-of-a-kind marble-like stone sculpture by Pierre Riche Nicolas — I have been motivated to learn more about the artists and artisans of this island nation. Fortunately, the resources on Haitian art are considerable. One of the most significant is the Webster University-based Bob Corbett art project, which comprises a list of more than 800 known Haitian painters. (Corbett spent many hundreds of hours compiling the list.) Another is a list of more than 5,300 pieces of Haitian artwork that has been photographed for publication in books, magazines or art-related periodicals, and exhibition and auction catalogues. Still another is the Haitian art collection at Bryant University; donated by Gladys Kinoian Lujan (Class of 1956), it numbers 19 works by 15 Haitian artists. Images of the charming and colorful work, with commentary by Lujan, may be viewed here. The film director Jonathan Demme, who describes himself as a "fairly fanatical devotee", has a renowned collection of Haitian art, some of which was on view last spring at New York City's French Institute Alliance Francaise as part of the World Nomads Haiti Exhibit (archived here; the 17-page event brochure is here). Demme owns some wonderful paintings, which he first began collecting in the 1980s. Following is a selective list of other sites you might want to visit to learn more about or indulge your interest in Haitian art. ◆ Art Works for Haiti. Sales of art benefit the village parish of Figaro. ◆ The Friends of Hopital Albert Schweitzer. This nonprofit sells Haitian art via the Web and at art shows; proceeds benefit HAS in Haiti. The gallery features some quite lovely pieces, which you may browse by artist name, style, and price ranges. ◆ Steel Drum and Metal Art. This site features the highly decorative metal art, including wall hangings, and steel drum art, which is recognizable worldwide. Artists make the art by burning the residue in a 55-gallon oil drum, splitting open the cleaned drum, and then flattening it to create a surface on which to draw. (More information on the art-making is here.) They usually use no more than a hammer, chisel, and nail to render bible scenes; designs of birds, angels, and fish and sea life; designs of mythical figures such as mermaids; sun designs; masks or faces; scenes of rural life; and tree-of-life designs. 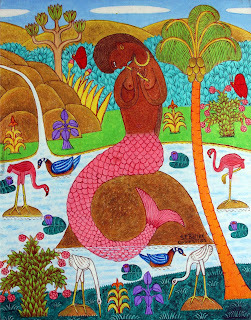 ◆ Haitian Art Society. This group is national and has local chapters (there is one in Washington, D.C.). Noted on its Website are tentative dates in November for the HAS conference in Haiti. ◆ American Museum of Natural History: Sacred Arts of Vodou. Here you will find information on vodou's roots, ritual practices, tools of worship, and more. ◆ Embassy of Haiti, Washington, D.C.: Visit this site for its brief history of Haitian art. ◆ Windows on Haiti. Go here and click on Paintings on the left side of the page to view representative works of 30 of Haiti's most accomplished painters. ◆ Haiti Art Cooperative. Art is purchased at fair trade value and resold for fundraising purposes through a network of nonprofit organizations with programs in Haiti that serve the poor. Currently, the site features a number of extraordinary vodou flags or ceremonial banners made with sequins and beads and backed with satin. Haitian vodou flags represent vodou spirits in images or symbols. What may not be so well known is that because slaves in Haiti were forbidden to practice vodou, they adopted Catholic saints to represent their spirits of love, water, trees, crops, and the like. ◆ Vassar Haiti Project. Fifty percent of art purchases from the Vassar Haiti Project, which is described in the video clip below, are donated to the artists or artisans whom the project supports. Hundreds of artists, artisans, and galleries associated with the project live or work in or near Port-au-Prince, one of the cities in Haiti hardest-hit by the January 12, 2010, earthquake. Little news of their fate has reached VHP, which has mounted its own relief efforts. One hundred percent of any checks mailed to the project (124 Raymond Avenue, Box 594, Poughkeepsie, New York 12604) are being donated to relief efforts. The village of Chermaitre has been a primary beneficiary of VHP's initiatives for some nine years and is the focus now of the project's relief efforts. Information about VHP's emergency assistance, what is needed, and how your donations will apply is here. The Vassar Haiti Project's blog is here. Vassar Haiti Project Documentary from andrew meade on Vimeo. As part of a small arts-based ministry called The Apparent Project, Corrigan and Shelly Clay train Haitians in fine art, sewing, and craft-making so that they can produce marketable art, clothing, jewelry, and other artisanal good that they can then sell to support themselves. The Clays live in Haiti full-time and have adopted two orphaned Haitians. Last week's earthquakes destroyed the beautiful windows gracing Holy Trinity Cathedral in Port-au-Prince; all now lies in ruin. To see how magnificent the windows were, go here. The loss is incalculable. Gary Steur, chief cultural officer for the city of Philadelphia who writes the blog Arts, Culture and Creative Economy, offers an interesting analysis of the National Arts Index 2009. The Index, comprising 76 indicators developed by the federal government and private research organizations and designed to measure the health and vitality of the arts in the United States, was announced by Americans for the Arts on January 20. The report on the Index, covering the period 1998 - 2008, is here. Below are descriptions for just two of many exhibitions now open around the Washington, D.C., area. ◆ Paintings, Sculpture, and Installations: Maggie Michaels ~ On view through February 12 at the Fine Art Gallery in George Mason University's new Art and Design building, this exhibition features Michaels's recent abstract works. Michaels is a recipient of awards from the Joan Mitchell Foundation, the D.C. Commission on the Arts and Humanities, and the Trawick Prize. The Art and Design building is on George Mason University's Fairfax, Virginia, campus. ◆ "A Deeper Reality" ~ Doris Colbert Kennedy's abstract paintings are on view at Foundry Gallery in Washington, D.C., through the end of the month. Kennedy's works are inspired by her knowledge of the concepts of theoretical physics and "intuit" movements of sub-atomic particles, waves, and strings. Kennedy calls them "energy-dances of color and motion." The exhibit runs through the end of the month. ◆ "Cream: WPA 2010 Art Auction Exhibition" ~ Opening January 30 and running through March 6, this Washington Project for the Arts exhibition will be on view at the American University Museum at the Katzen Arts Center, Washington, D.C. The exhibition and auction will feature works by more than 100 local, regional, and national artists selected by top curators, including Kristen Hileman of The Baltimore Museum of Art, Carol K. Huh of the Freer and Sackler Galleries of Art, N. Elizabeth Schlatter of the University of Richmond (Virginia) Museums, Mera Rubell, co-founder of the Rubell Family Collection (Miami, Florida), and Ken Ashton of the Corcoran Gallery of Art. A preview of the exhibition and a talk by all the participating curators is scheduled for February 25, 6:30 p.m. - 9:00 p.m.; admission is free and open to the public but seating for the talk is limited (RSVP by February 19 to info@wpadc.org). The auction will take place on March 6. ◆ "Art Night at VISArts" ~ On February 5, 6:30 p.m. - 8:30 p.m., VisArts at Rockville, Rockville, Maryland, is holding its February Art After Hours event, featuring art, music, and drumming. This promises to be another wonderful evening to meet the VisArts studio artists; snack on delicious food (always a treat); observe and participate in a drumming circle to be led by Nancy Nuttle, founding director of Child's Play Music LLC, home of Music Together Montgomery (you may bring your own drums or other small percussion instruments); and do a bit of Valentine's Day shopping in advance. I plan to be there with my latest thread painting edition, "Peacock (Crimson)". ◆ Spring Arts Workshops with Judith Olivia HeartSong ~ Judith, whom I interviewed last fall (click here for the interview), is kicking off the New Year with two wonderful arts workshops: "Go Fly a Kite", in four sessions beginning February 24; and "Running with Scissors Mixed Media", for adults of all skill levels, on Mondays beginning February 1. Detailed information is available on the VisArts site or by calling Minna Philips, VisArts director of education, at 301-315-8200. The National Geographic Magazine Photography Grant competition has been announced. Submissions are due March 1 and the winner will be announced June 1. Details about the grant — $30,000 for a specific project to inspire people to care about our planet — are here. Check out ArtsMap: Connecting Artists and the Community, a worldwide project of the artists Jonathan Talbot and Robin Colodzin. If you are an artist, art gallery, or museum or other arts-related organization or business, you may open an account to list your Website and provide information about your art (there are several dozen categories) or what you do. ArtsMap is an interactive map that can be used to search by medium, location, educational opportunities, type of organization, or other criteria; using user-generated clickable map markers, you can obtain detailed information about artists, their work and studios, art schools, etc. ; most markers contain an image and a link to a Website or blog. When you sign up now, your listing will be free for 12 months (the offer is time-limited, so don't delay); thereafter, a fee will be charged (to read about ArtsMap unique approach to pricing, go to the site, click on About and then click on Pricing. A popup will provide the information). I listed my Web-based company Transformational Threads and my friends in the arts have listed their sites, too. The greater the number of registrants, the more useful ArtsMap will become. Illustrating how holiness can empower women and how empowered women endeavor to ensure God's reign, Holiness and the Feminine Spirit: The Art of Janet McKenzie matches 28 full-color paintings by Janet McKenzie with reflections by leading writers, all of whom are women. Contributors include author and spiritual guide Joyce Rupp; social psychologist, communications theorist, and columnist for the National Catholic Reporter Sr. Joan Chittister; writer, speaker, and scholar in American religion and culture Diana Butler Bass; theologian Elizabeth A. Johnson; art historian and critic Sr. Wendy Beckett; best-selling novelist Ann Patchett; social activist and writer Helen Prejean; feminist theologian Chung Hyun Kyung, and Presiding Bishop of the Episcopal Church Katherine Jefferts Schori. 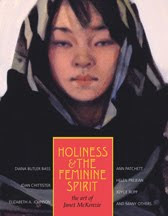 Susan Perry is editor of Holiness and the Feminine Spirit (Orbis Books, 2009). Janet McKenzie, an award-winning artist who lives and works in Vermont, is known for art that celebrates women. She is the creator of the controversial Christ, Jesus of the People, which Sr. Wendy Beckett chose as the winner of the 2000 National Catholic Reporter competition for a new image of Jesus in the Millennium. "I see the mother of God in women of all races and ages," McKenzie exclaims, "although rarely do they know what I am seeing, or how inspirational I find them." It was a fantasy world I escaped to . . . That's how my career as a micro-sculptor began. Made an "example of failure" at age 5, Willard Wigan created a place for himself where, he said, his dyslexia couldn't hold him back and his teachers couldn't criticize him. He imagined that place while looking down at the ground, where he spied some tiny ants that he decided needed somewhere to live. Willard Wigan is a micro-sculptor. His art fits on the head of a pin and inside the eye of a needle. It's invisible to the naked eye. Wigan cuts what he needs with a blade fashioned from a needle. He paints with a hair from his face or an eyelash. His takes his materials as he finds them, from fine gold, carbon fibers, swirls of dust particles snatched from the air, grains of sand. Everything Wigan does, he does using a microscope, with a hand steadier than a surgeon's applied between heartbeats. Wigan's biography, I Spy With My Little Eye, may be purchased here. Ripley's Special Edition 2010 includes a page on Wigan. BBC Website coverage of Wigan is here. Additional videos of Wigan's appearances may be viewed here. a clear image that appears like a dream. 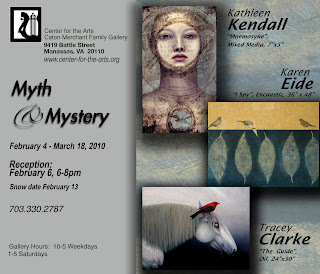 Painter Tracey Clarke will be exhibiting soon in "Myth and Mystery", opening February 4 at Caton Merchant Family Art Gallery at the Center for the Arts at the Candy Factory, Manassas, Virginia. (That's Tracey's "The Guide" at the bottom of the card for the show.) The exhibit, running through March 18 and also featuring artists Karen Eide and Kathleen Kendall, includes oils, encaustics, and mixed-media works. Tracey, whom I first met at her recent solo show at the Athenaeum, in Alexandria, Virginia, is a superb painter. She has been painting full-time for about 10 years. Her subjects are animals — not surprising, given that she worked a decade as a veterinary technician. In her cohesive body of oils, she mines her love and knowledge of animals and her sensibility of animals' mythic qualities to create work that is imaginative, dramatic, as likely dark as joyful, pushing the surreal while preserving the recognizable. The longer you look at them, the more, it seems, the paintings take on narratives of their own, separate and apart from whatever the artist might have suggested originally and influenced by your own narrative as viewer. I find Tracey's work to be deeply intuitive. Indeed, when painting or in the presence of animals, Tracey writes on her Website, "[t]here is a kind of communion that takes place between me and God." I asked Tracey a question or two and she graciously provided the following responses to accompany this announcement of the Caton Merchant show. Maureen Doallas: Tracey, you quote Edgar Degas's statement that "[a]rt is not a matter of what you see, but what you can make others see." That word "make" interests me. When you paint, what is it that you endeavor to "make" others see? Tracey Clarke: Those words of Degas have always been intriguing to me, though his intent may be different from mine. All art is an illusion, and the artist conveys what she sees, which may be wholly different from what someone else might see. We each tend to pick up something unique in the art we view, hear, or read. In applying this statement to my work, I really am speaking of the use of the surreal and narrative elements to "uncover" or reveal something that might not be immediately apparent to the viewer, yet use them in a way that leaves room for the viewer to add [his or her] own discoveries. I hope to "make" them see my message and also to make them see their own. MD: You write in your artist statement that you use your imagination as a catalyst for "new mythology". What does that "new mythology" comprise? TC: The New Mythology is a body of paintings in a story based in a particular time and place over the expanse of a certain history. The myth is built around relationships between animals, using anthropomorphism. Generally, the themes center around the ideas of companionship, union, and service in times of difficulty as well as special "gifts" of the subjects bestowed by God for creation. Some of the narratives that accompany the paintings are bits and pieces, snips of time in this world, and others, like the "War of Birds", are ongoing and have a historical record in the Corvidae Legends. My intention is to do an in-depth interview with Tracey as soon as our schedules permit. In the meantime, I hope her answers here intrigue you enough to attend the exhibit during its run or, if you are not in the area, to visit Tracey's Website or her blog and follow her on Twitter. She is also on FaceBook. American Paul Farmer, M.D., is a Deputy United Nations Special Envoy to Haiti and the Presley Professor and Chair of Harvard Medical School's Department of Global Health and Social Medicine. An expert in infectious diseases, as well as a teacher, researcher, and clinician, Farmer has worked in Haiti for years. about a place like Haiti. . . . The story of Farmer's devotion and service to Haiti is told beautifully in Tracy Kidder's Mountains Beyond Mountains: The Quest of Dr. Paul Farmer, A Man Who Would Cure the World (2004; paper, 2009). While still a medical student at Harvard, Farmer set up in Haiti's central plateau a complex of public health care facilities, Zanmi Lasante. Farmer's endeavor defied the odds of failure, as Kidder recounts in Mountains Beyond Mountains, and today it continues against all odds to respond to the many needs of Haiti's desperately poor population. It has become the largest health care provider in the country. and his gift is healing. Since the massive earthquake on January 12, Lasante staff have set up triage centers in Cange to treat the injured and are coordinating and assisting with relief efforts in Port-au-Prince, St. Marc, and other locations. Farmer's Stand With Haiti is collecting donations to aid Haiti in its recovery from last week's disaster. In addition to communicating instant updates on Haiti via Twitter, Stand With Haiti is maintaining a blog to monitor conditions on the ground, deliver messages and news from Lasante staff, and coordinate logistics, humanitarian relief, and calls for and receipt of volunteers, supplies, and monetary or other donations.